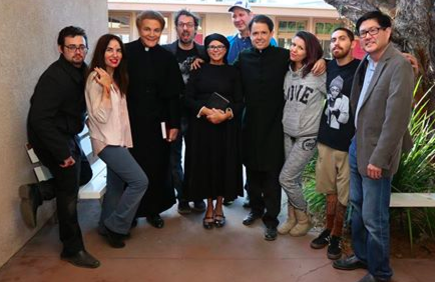 Los Angeles, CA, January 30, 2017	(Newswire.com) - ​​​​​​​​​​​​The riveting first official teaser trailer for the new supernatural horror film HOLY TERROR was just released today. This film is in post production via Cineridge Entertainment from the award-winning team who previously brought us SAMURAI COP 2: DEADLY VENGEANCE. Written and directed by Rich Mallery (SOCIOPATHIA) and executive-produced by Gregory Hatanaka (who helmed SAMURAI COP 2 from a script co-written by Mallery), HOLY TERROR stars MEATBALLS’ Kristine DeBell, Bruce Lee's GAME OF DEATH's Mel Novak, Lisa London (H.O.T.S., PRIVATE RESORT), Kelly Reiter (The Z Virus), Jesse Hlubik (MAY, ALL CHEERLEADERS DIE), Nicole Olson, Scott Butler (WIENER DOG INTERNATIONALS), and Vida Ghaffari (THE MINDY PROJECT, JIMMY KIMMEL LIVE).